The Export Project dialog box lets you export your storyboard to a third-party software using XML or AAF format. You can then edit your project, and import the changes back into Storyboard Pro—see About Conformation. Render Images On Export When enabled, this exports the images associated with the video clips. This is enabled by default. You can disable it if you are re-exporting your sequence and don't need to export the images again, to save time. Otherwise, disabling this option will cause the exported sequence to be missing the image files linked to the clips. Lets you select export format, Final Cut Pro XML or Media Composer AAF. Exports the drawing layers in your panels as separate video clips instead of flattening them together to make one clip per panel. This option is only available when exporting in Final Cut Pro XML format. When exporting one image per layer, this will store all the layers for a single panel into a nested clip. By default, different layers are spread on different video tracks, except when a panel contains both camera movements and layer animations. Prints the camera frames on the exported images. The first camera frame will be printed in green, and the last camera frame will be printed in red. This can also mean that, within a same scene, a panel that has a camera zoom-in or zoom-out will have to be exported in a bigger resolution than the other panels in the scene. 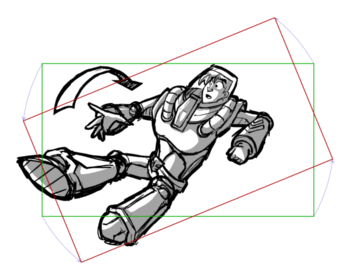 With this option enabled, all the panels in any given scene are exported in the same resolution. NOTE The panels will appear as expected in your video editing software regardless of whether or not this option is enabled. NOTE Since the images exported for conformation are generally not imported into the Storyboard Pro project when you re-import your sequence, the quality of exported images is not critical. Hence, the default image format for conformation is Jpeg (*.jpg). Although Jpeg images do not preserve picture quality, they are quicker to export and do not use a lot of disk space. Places a chapter marker at the beginning of each scene. These markers are used to find the in-point of each scene when conforming from Final Cut Pro to Storyboard Pro. The markers are named "Scene:" followed by the name of their respective scene, and they have a unique scene ID and chapter marker as their comment. Adds an extra video track to the sequence in which images indicating the number of the current scene are displayed. Includes the captions of each panel as metadata in the exported sequence. The captions can be edited in the sequence, and importing modified captions will update the captions in the Storyboard Pro project. If you're exporting the project's captions and your captions have special text formatting, this will export the captions in HTML instead of plain text, to preserve their formatting. If you export your captions in plain text, then re-import them, they will lose their formatting. However, plain text captions are easier to read and edit in third party software. 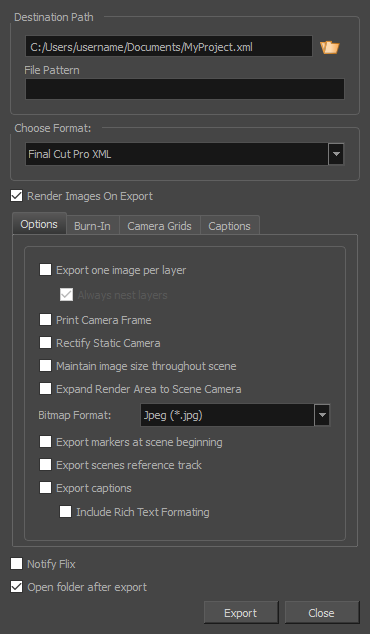 Choose not to print captions (None) or select one of your project’s captions to print into the exported bitmaps. By default, a Storyboard Pro project has Action Notes, Dialog, Slugging and Notes captions, but you can also choose to print custom captions if your project has any. Sets the size of caption lines relative to the height of the exported bitmaps. For example, if exporting bitmaps at 1080p with 3% Height captions, each caption line will be 32 pixels in height. Prints the captions at either the Top Left, Top Centre, Top Right, Bottom Left, Bottom Centre or Bottom Right of the bitmap. By default, captions are printed to the Bottom Centre. When new XML data is exported, a message is sent to Flix so it will automatically update its asset database. Note that Flix must be installed on your computer.